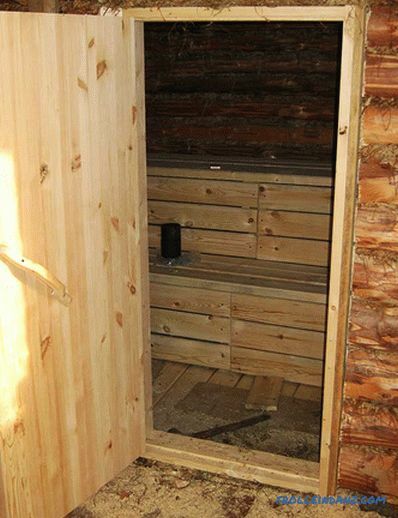 Independent production of a bathhouse structure on the garden plot is connected with the need for competent solution of many technical issues, including the choice of doors for it. 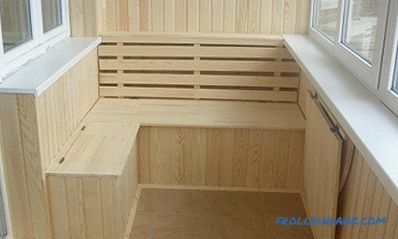 This should take into account not only the size and shape of the future door for the bath and sauna, but also the material from which it is supposed to make it. 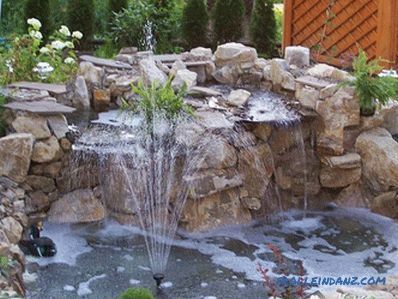 When considering this issue, the main attention is usually paid to the doors leading to the steam room, since it should support the microclimate necessary for the adoption of bath procedures. There should be no noticeable temperature fluctuations in the steam room due to uncontrolled leakage of steam through the open door. 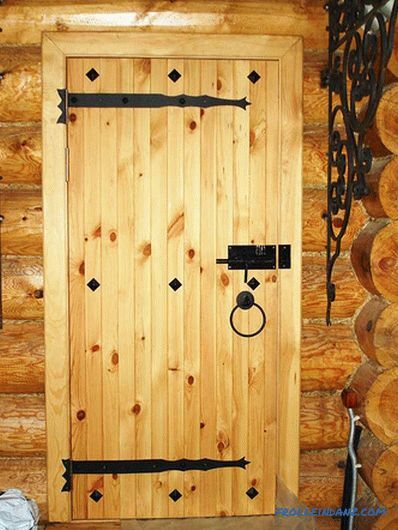 Materials that are resistant to moisture and high temperatures should be used for facing the inner surface of the door. The doors to the steam room must have a size that excludes the possibility of uncontrolled steam loss when opening them (when entering and leaving the room) . The door structure should be reliably insulated (using mineral wool or felt, for example). In order to avoid destruction of metal fastenings, the doors in the steam room should be mounted so that the hinged elements (hinges) are located outside. When choosing the dimensions of the door frame, as a rule, they proceed from standard conditions assuming the height of the opening in the range of 160-170 cm with an approximate width of 60 cm. 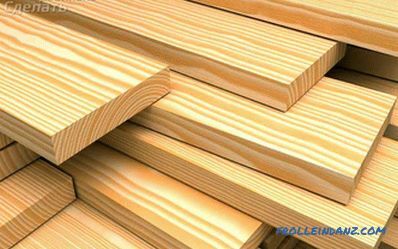 Of the known types of wood, its common species such as spruce, linden, larch, aspen, pine or cedar. If you can choose from the series listed above, preference should be given to linden, which is easy to process, has a unique texture and emits pleasant-smelling substances when heated, which also have healing properties. 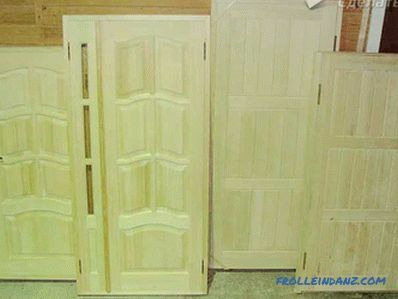 Doors are manufactured according to a standard scheme, in accordance with which the door block is assembled from board blanks specially prepared on a milling machine (two sidewalls and two lintels). 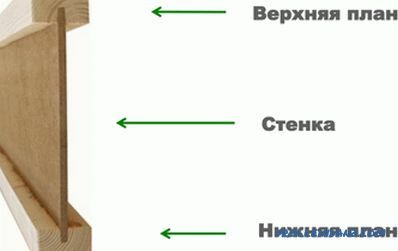 Their basic parameters, such as length, thickness and width, are chosen taking into account the planned size of the door frame, which was already mentioned earlier. It is very important that all elements of the strapping be installed in the doorway correctly and not distorted. 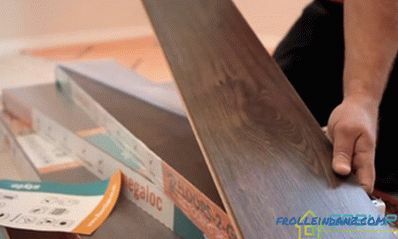 When preparing a plank door, the boards are first cut to the size of the canvas, after which a shield is assembled from them. During assembly, the dimensions of the canvas and its diagonal should be strictly controlled. At the end of the work, the door material is given some time for final drying. 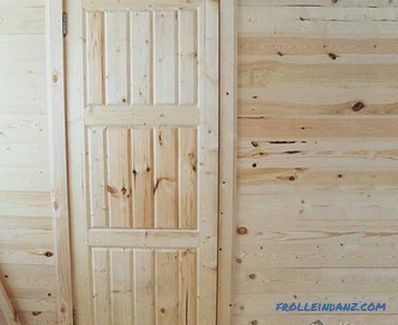 It should be noted that the doors made of lime boards have a presentable appearance and provide reliable protection against heat leaks through them. 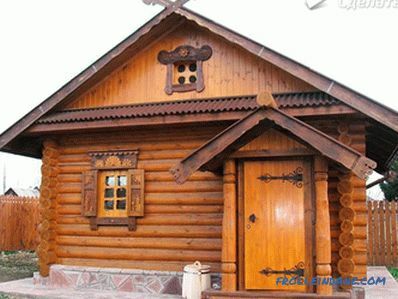 When assembling, it is also necessary to ensure that there are no knots in the boards, which reduce the strength of the entire structure as a whole. 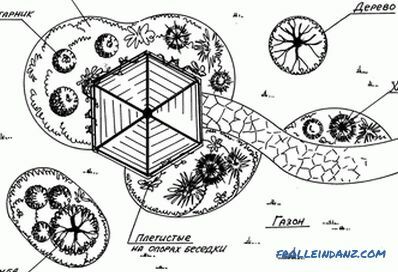 The door leaf from a bar is made, as a rule, in the form of a solid array, but in some situations it is possible and variant of its execution in the form of a lattice structure. In the latter case, the finished frame is necessarily sheathed with decorative material. Well, in the "continuous" canvas, the individual bars fit as closely as possible one to another, after which their joints are necessarily treated with special sealants. When arranging the doors of any design between the threshold and the door block, a centimeter gap is required to remove excess moisture from the steam room. Individual performers prefer the so-called paneled door leafs with a wooden frame base to all the listed options. 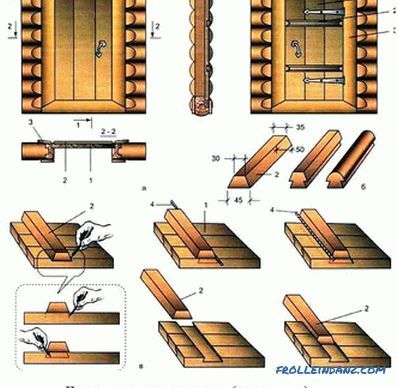 In order to increase the strength of the door structure during their manufacture, small vertical inserts ("center pieces") are embedded in the canvas. At the same time, during its formation, special horizontal bars, called crossbars, are used. For additional hardening of the design, the lower bar of the door frame is made in this case from a thicker workpiece than the upper crossbar and side racks. We also note that the use of one or another type of glazing is quite acceptable in door panels of paneled type. 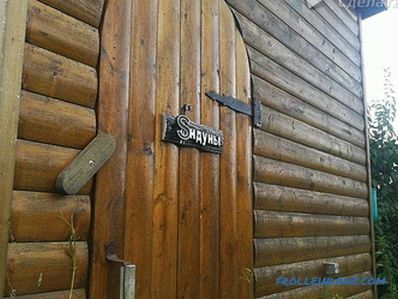 Door leaf made of boards or timber, needs, as already noted in the cladding, which is most often performed from decorative wall paneling. 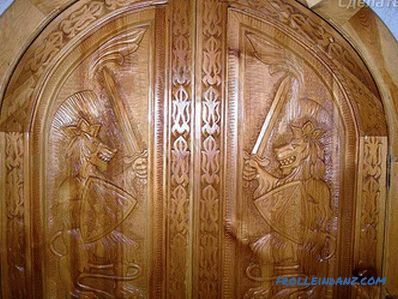 Note that before covering the wood door must be treated with a special composition that protects the material used from mold and fungal formations. 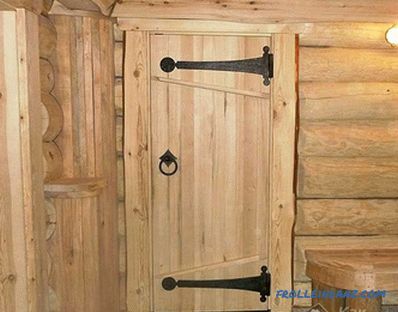 At the final stage of the work, the doors are installed and the accessories are mounted on them, represented in this case by such mandatory elements as sheds and door handles. Decorative loops or canopies are mounted, as already noted from the outside (from the side of the waiting room). 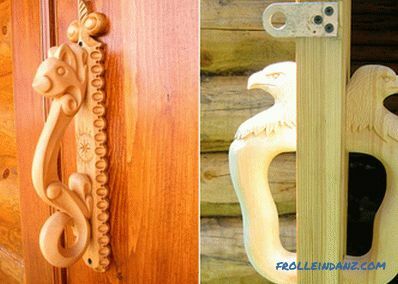 A handle for the entrance door is preferable to make of the same wood. This trick allows you to protect your hands from direct contact with a hot metal.